Wild: Lystrosaurus Aicifidelis is a small herbivore, common to much of the island. Only about two feet long, it is not high on the food chain, and eats small plant life. The poisonous insects of the island seem to have little effect on Lystrosaurus. Domesticated: Not surprisingly, Lystrosaurus is an extremly loyal pet once tamed. It’s a very fast learner, so it gains experience much more quickly than most other creatures. Additionally, its presence nearby appears to inspire allies, making them learn and gain experience more rapidly as well. Thusly, Lystrosaurus is an excellent addition to any tribe’s hunting party. 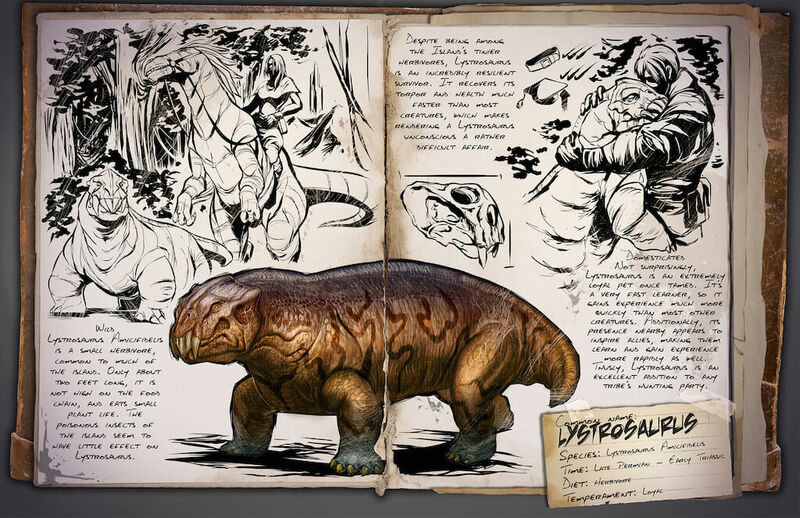 Known Information: Despite being among the Island’s tinier herbivores, Lystrosaurus is an incredibly resilient survivor. It recovers its torpor and health much faster than most creatures, which makes rendering a Lystrosaurusunconscious a rather difficult affair.